Probably nothing that is written in this review will affect the juggernaut of what is essentially the eighth Harry Potter book. 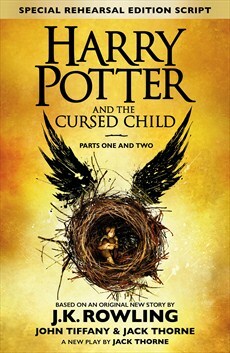 Harry Potter and the Cursed Child, the rehearsal script of the new two-part play set nineteen years after the events in the Deathly Hallows, returns readers to familiar locales, spells and situations but with a new generation of teenagers at the helm. The centre of The Cursed Child is two confused, fairly typical teens. Albus Severus Potter, middle child of Harry Potter and Ginny Weasley, is failing to deal with family fame and has been sorted into (gasp!) Slytherin. While his new best friend Scorpius Malfoy, son of Harry’s schoolyard nemesis Draco, is subject to a painful whispering campaign about his parentage. But plenty of loved characters also feature either in main parts of the plot or dream sequences. For long-time fans of the books this is an opportunity to revisit characters like Harry, Ron, Hermione, Ginny and Draco in their middle age and see how their exploits both define and restrict them. At the centre of the action of The Cursed Child is a tricky narrative device – the timeturner. Rowling used this device to great effect in the third Harry Potter book The Prisoner of Azkaban. In that book, the potential paradoxes and multiple universes that could be caused by unchecked time travel were carefully contained. In the world of The Cursed Child timeturners are outlawed due to the havoc they can cause but that does not stop one coming very much into play. But like the devices themselves, time travel as a narrative device is tricky to pull off. It does allow Rowling and her cowriters to explore potentially alternative presents and explore the moral time travel quandary of whether you allow people to die if you know it will protect the future. But the way it works and impacts on the characters involved does not bear too much thought or investigation. The Cursed Child is a message play. It focuses strongly on the relationship of parents and children, particularly that of Albus and his rocky relationship with his famous father Harry Potter and Scorpius with his father Draco Malfoy. While these conflicts are necessary to drive the drama, their portrayal and resolution is extremely heavy handed and broad brush. All that said, it is likely that The Cursed Child would work really well on stage, particularly for the younger audiences who, it must be remembered, Potter is actually pitched at. The staging on paper is incredibly ambitious, and most of the quibbles about plot and character may well fall away in the presence of dazzling sets and solid performances. Because in the end, theatre, done well, has the power to work its own magic.